Normally, I’m pretty hesitant to watch any movie that’s overtly marketed as “Christian.” The truth of the matter is, while I’m a Christian myself, these types of movies normally make me cringe at how cliche they are. When their message is continually shoved down our throats, it’s hard to focus on anything else. I am all for inspiring stories of faith, but when the main thrust of your plot feels like a poorly written after-school special, it’s hard to take seriously. Case in point: I really didn’t like War Room (2015) not only because of the aforementioned qualms with the genre as a whole, but also because the characters and their actions felt completely unbelievable (and for a film about belief, this was a big no-no). Now, as you’re aware of my stance on these types of movies, please note that I prefaced this with “normally”. There are some films in this genre that do a good job of presenting men, women, and children of faith without making it the supreme focus of the film. For example, Soul Surfer (2011) was an excellent film in this genre because it focused more on the girl’s faith that everything would turn out OK, even if she just had her arm bitten off by a shark. It’s in these scenarios, where everything seems to go wrong, where we find the best stories about faith, perseverance, and God. This is why Miracles from Heaven (2016) is now my best example of this genre. Not only did this film cover the mother’s fall away from the faith in the light of difficult medical circumstances (as most people would do), but it wasn’t heavy handed about the faith aspect of the plot at all. In fact, the continual string of events leading to worsening conditions for her child played out much like they would for anyone who has had to take care of someone with a serious medical ailment. There are no answers as to why the family had to go through the ordeal, no answers as to why God lets this happen, and no answers as to how He was able to miraculously heal the girl, even in the midst of another tragedy. Because of these lack of answers, the other lives touched by the journey, and the lives who touched the family during the journey, Miracles from Heaven provides an incredibly realistic view at a situation that can only have one answer: God. Overall, a realistic film that will have you literally crying tears from every emotion (sadness, joy, etc. 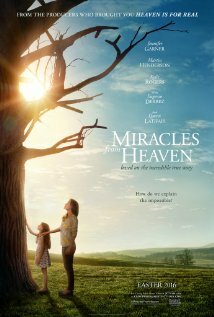 ), I give Miracles from Heaven 4 stars out of 5.